Home >> Microsoft >> Windows OS >> Disable Copy Paste, Cut, Move, Delete, Rename, Move To, Send To, Copy To, and Task Manager In Windows. Cut, Copy, Paste, Move, Delete, Rename, Move To, Send To, Copy To are the most commonly used functions in Windows OS, these functions are the ones lead to data loss either through data transfer/data deletion.You can disable these functions in Windows OS, using a tool called Prevent. 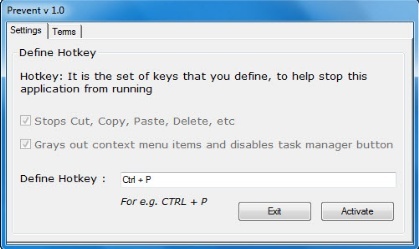 Double Click on Prevent and set your Hotkey to stop Prevent.The next time you leave your system start Prevent to disable the following functions. Disables Task Manager-End Process button. Also it doesn’t allow right click on process name and click on end process. To re-enable the functions press the Hotkey you setup (For Ex.Ctrl+P ).The default hotkeys are Win+F8 to kill Pre_1 and Win+F9 to kill Pre_2. But the single hotkey set by the user will kill both processes at the same time. Tip : Create a Keyboard shortcut to start Prevent faster, instead of having a shortcut for the app on the desktop. Similar Post System Explorer - Check Detailed Information About Windows Tasks, Processes, Modules, Windows Services Opened Files and Folders. Please post the link to download v 2.0, Thanks.